Merle grew up in Iowa and graduated from Burlington High School in 1952. He received his B.S. degree from Iowa Wesleyan College. He moved his family to Tucson in 1968 when he was recruited by Roy Jackson to organize a AAA Pacific Coast League baseball team. He named it the Tucson Toros and he became its first general manager. The city of Tucson fell in love with the team and established some of the highest attendance records in all of minor league baseball. Its best year was in 1973 when more than 233,000 fans crowded Hi Corbett Field. Then Toros won the coveted Larry MacPhail Promotional Trophy as the top minor league team out of 144 teams nationwide. That same year Miller was named Executive of the Year by Sporting News. 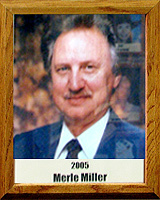 After general manager of the Toros for seven years, Merle wanted to continue to promote professional sports in Tucson and he helped bring many other pro sports franchise to Tucson, including the Tucson Mavericks of the Central Hockey League and the Tucson Turquoise, a professional volleyball team. In 1982 Merle managed to get the NCAA to certify and create a new college bowl game to play at the University of Arizona stadium. Eventually the first game of the Copper Bowl was held in 1989. For more than eight years the Copper Bowl brought some of the best college teams in the country to a desert showdown, showcasing Tucson and its people. It had the reputation as one of the best bowl games in the entire country. The Copper Bowl eventually changed its name and moved to a new location in Phoenix. Merle has been recognized with several awards for his sports administration and guidance. He still calls Tucson his home.